It had been nearly four weeks since I had last climbed to a summit and I was growing antsy. Too many competing things had conspired to keep me grounded and I was getting tired of doing home repairs. 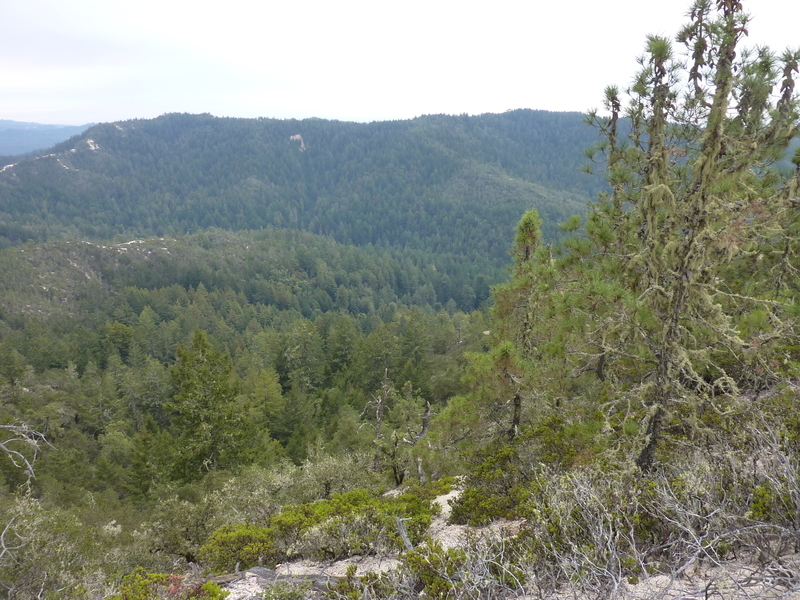 I decided to pay a visit to Big Basin Redwoods State Park and climb a few insignificant summits in the southwest corner of Santa Cruz County. Steve came along to join me without even caring much where we were going other than the not-very-descriptive, "Santa Cruz." Turns out, he had been on my first attempt to reach Chalk Mountain five years earlier, starting from Waddell Beach. We'd run out of time that day and I came back four days later to hike it from the West Ridge Trail off Whitehouse Rd. We would use this latter approach again but make a longer outing by tagging a few minor summits around the perimeter of Whitehouse Canyon. In order to make a loop of it, it was necessary to pass through some private property. If this proved unworkable, our 9mi outing would become more like 15mi - giving us some incentive to make it work. We started just before 10a and made our way up the switchbacks on the West Ridge Trail. Though conditions were dry as in much of the state, the trail passes though a very nice mixed redwood forest as it makes its way to the more open and drier regions along the ridge. There are several overlooks enroute, offering views to Ano Nuevo State Reserve and the ocean. Overcast skies were welcome to keep the temperatures cool for our hike, but did little for the photo opportunities with washed out colors. The trail meets up with the dirt Chalks Rd after reaching the ridgeline which continues east towards our first peak. We reached the west summit of Chalk Mtn in just under an hour. A label on the communications shack has it as "Chalks Mt". I noticed my GPSr showed a geocache somewhere around the summit so we spent some time looking for it, but coming up empty. Steve was disappointed, hoping to chalk up his first geocache find (pun intended). In this he was in luck - there are geocaches all along Chalks Rd - Big Basin is pretty lax about allowing geocaches compared to other state parks. It was only 15min after leaving the summit that we found one just west of the higher east summit (the summits are about a mile apart). It was well hidden with camouflage duct tape behind the trunk of a tree off the road. It had the usual assortment of trinkets and a register in which we dutifully logged our find. The east summit features more solar panels, a small communication tower and an accompanying shack. A lookout tower used to sit atop this hill overlooking the Santa Cruz Mtns but has long since been removed. All that remains is the outhouse which has been painted relatively recently though no longer functional (actually I suppose you could still use it, but thankfully no has, at least of late). The outhouse was featured in another geocache description which said the location was visible from "the throne". While Steve sat on the seat I looked around at the possible locations, eventually finding it under some brush and debris - our second find. We left the summit and returned to the road, now heading NNE along a ridgeline called The Chalks on the topo map. It consists of lightly-colored rock, very loose and brittle. There were more geocaches to be found, but by now Steve said he'd lost interest in the pursuit - it brings civilization and its distractions which he preferred not to have on his hikes. I didn't care much one way or the other so we stopped looking. When we reached the location of The Chalks highpoint about a mile north of Chalk Mtn, we had some trouble reaching the top. Our first attempt at a turn in the road was an introduction to just how loose this stuff was. Essentially sand at the angle of repose, we struggled to get up, only to be stopped by the brittle rock forming a headwall above the road cut. We tried a second location that worked only because there were some roots that could be used to haul ourselves above the brittle rock band. There wasn't anything to the summit - a silly effort only a peakbagger could appreciate. Another mile north of The Chalks got us to a major trail junction. Not far below to the east is Sunset Trail Camp. To the north the trail crosses the boundary with San Mateo County and joins up with the Johansen Rd which can be taken further north to China Grade. Our route around Whitehouse Canyon took an old spur road, no longer maintained, that Google Maps has labeled as Old Womans Creek Rd. Though its been decades since it has been driven on, it has seen some periodic maintainance to cut back the brush and keep it serviceable. We had some downfall to duck under or over and there was much erosion evident along the way, but happily no bushwhacking necessary. Shortly before reaching Peak 1,688ft we came to a boundary gate marking the private property. Just above this was the uninteresting summit of Peak 1,688ft, tucked away in the forest without any views. I laid out the remainder of the outing for Steve in simple terms - we were two miles from the car if we continued through private property, seven miles if we went back the way we came. I didn't really have much doubt which way he'd chose, but I wanted to make him equally culpable. As we continued on one of the branches of the old road, we started to think we'd have little chance of encountering anyone and then only moments later spied a truck parked in the middle of the road just ahead. This told us the unused road was soon to become serviceable again and that in fact we might run into problems. By myself I might have turned back at this point but Steve said he was less concerned about confrontations if it means he can take the easy way back. We approached the truck slowly, only to find it was more or less abandoned and had been sitting there for a year or two, judging by the dirt and debris on it and the expiration of the license registration. The road showed recent tread marks and it appears there are one or more private lots along this stretch of road. Our relaxed feeling upon discovering the vehicle unoccupied lasted only a few minutes until we came upon a second vehicle next to a poorly constructed man-shack on a small site. the shack was without windows (storage, maybe? ), but the truck looked relatively clean with the windows cracked open to allow air. It looked like it had just been driven there. We quietly passed by, looking back a few times, half expecting some screaming mountain man to come running after us. Happily, none did. A few more minutes went by until we discovered some well-maintained trail signs, evidence of the Girl Scout camp I knew we'd have to pass through. This seemed a much better deal than some unknown, anti-social crazy living on the edge of the grid.